This graphic shows where outsourcing has been very effective for organizations. And the mid-market buyers have been enjoying considerably more success in every area – from cost reduction through to global effectiveness, through to getting better business process improvement and technology. In the mid-market, organizations are less well-resourced – they often have legacy IT and can’t often afford to have well-paid top-notch finance, procurement, HR and operations talent. Hence, having skilled service providers take on their stuff has been – by and large – a positive experience for them. Their bigger counterparts tend to have more sophisticated ERP and empires of IT, finance, procurement and HR. When the large firms outsource, they don’t really want to change the way they do things – they simply want to run them the same way at a lower operating cost. While a mid-market organization may not wield the same level of aggressive cost reduction through large-scale labor arbitrage as larger enterprises, they clearly enjoy the benefits of accessing improved technology and process expertise. Enterprises usually have a lot more staff supporting business functions, and many of them are today outsourcing in increments, perhaps starting, for example, with accounts payable, before extending to receivables, reporting, procurement and analytics. They are large enough to be able to dictate to suppliers their preferred pace of outsourcing. Many mid-market firms may only have, for example, 150 people in finance and 25 in procurement. They're pretty much going to have to bundle as many staff into the first deal to attract a top tier provider and don't have the "luxury" of outsourcing step-by-step. Moreover, the fact that most of the mid-market buyers have to outsource more processes and staff faster correlates with the increased satisfaction ratings - a more rapid transition to an end-state clearly helps drive transformation and improvements in process. 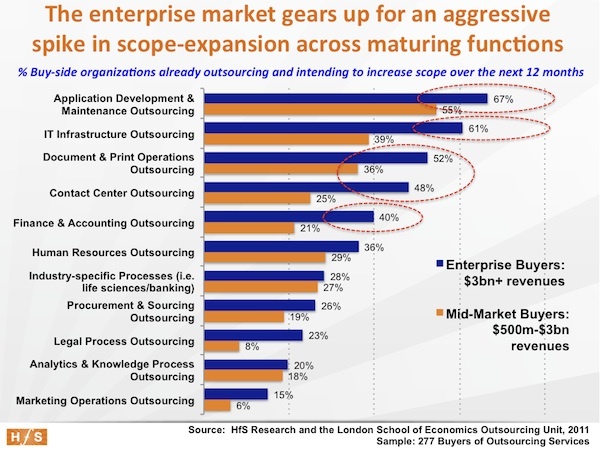 Large enterprises continue to dominate the lion's share of current outsourcing activity - because they are tending to outsource in smaller increments which, in turn, is inhibiting change and encouraging them to muddle through with their existing processes, which are often inefficient and not very effective in a global outsourcing delivery model. As this data plainly illustrates, large buyers are not holding back when it comes to expanding their outsourcing engagements in established areas where they have eager suppliers swarming all over them to take on more work. For example, 40% of large buyers already outsource parts of their finance and accounting and are looking to grow their engagements, half of them are doing likewise with document and print management, and two-thirds in application development and maintenance. It really does beg the question: why continually look to increase scope, when you could have outsourced a load of these processes years ago? What were you waiting for? Let's be realistic here - organizations outsource processes that probably aren't very well run in the first place. Why persist is continuing to run them poorly and take 5 years to reach a point where you finally admit you have to change? HfS believes the whole "softly, softly" approach to outsourcing that we are seeing from many enterprises, is prolonging the disruptive change a buyer needs to go through to reach its desired global operations end-state. Enterprises clearly struggle to achieve the business benefits of smaller organizations which are forced to bite the bullet and take on new ways of running processes when they outsource. Moreover, the mid-market is clearly becoming the testing ground to develop more standardized outsourcing models that can be implemented quickly and incorporate quality process workflows. Moreover, the opportunity is clearly there to bring together much more "industrialized" outsourcing solutions that incorporate software IP, analytical outcomes and BPO. HfS strongly believes that providers need to attack the middle market, in addition to the "easy dollars" at the enterprise level, in order to develop a balanced portfolio of clients: enterprise engagements will serve up profit and delivery scale that can be invested in middle-market clients which are road-testing these industrialized solutions of the future. The more you retain, the worse your outcomes. This has been intuitively true to all of us for a while, but now we have data to prove it! Acute, short-term pain is better than dull, long-term pain. Mid-market actually appreciates and is willing to take advantage of provider’s full capabilities. Large companies due to ego, politics, and maybe even a few legit requirements legislate the value down. I want the SPs to prove that they can continue to evolve the processes after they've received them. Buyer owns an old car. Buyer trades in the old car to SP and asks SP for a new car lease. Seven years later, is the once new car old? Can the buyer lease a new car? What are the lease conditions? Excellent analysis, HfS team - you have built an amazing research engine which is finally revealing some real truths about the outsourcing industry, that many have suspected for a long time, but never had the data to back it up. Buyers need to be bolder when they outsource, if they truly want to change processes and do more than labour arbitrage. When they say they want "transformation" but are only willing to let go parts of a process, or only a very transactional area, how can the provider do much beyond an operational service? A willingness to take a great initial risk can - as this data signifies - lead to a greater and faster reward. Interesting data. Have you considered that many of the smaller firms are using smaller providers, which may be going the extra mile to help there clients? Very nice analysis. The other big advantage be it mid sized firms or large enterprises is the transformation that happens within the outsourcers organisation.The data provided adds more value to the topic. Phil, absolutely agree with the HfS article on the 2 key points; pace of outsourcing, benefits to mid-market enterprises. 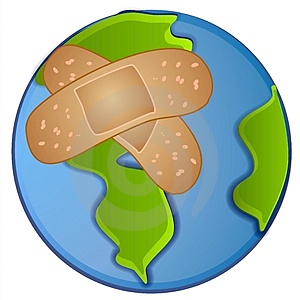 My experience has been that taking the deep plunge (ripping the band-aid) has led to an overall shorter period over disruption and higher levels of benefit. While there are no doubt some benefits in trialing or piloting, a long, staggered approach prolongs the pain and provides organisations more opportunities to check out of the outsourcing process; reducing benefits, increasing uncertainty and prolonging disruption. In contrast a shorter timeframe, deeper approach moves the organisation forward quickly and shifts focus 'are we doing the right thing' to 'lets get this working and drive the benefits' - a much more preferable state of mind. I agree with your points on the mid-markets, while they have arguably fewer heads and hence lower absolute arbitrage opportunities by tapping into the scale, efficiencies and capabilities of SP's they can rapidly move up the capability curve for the outsourced functions. The flow on benefit is more executive and managerial focus on the core business. Be interested to see correlation of overall business performance to outsourcing to see how the benefits the article highlights flows through to the bottom line. Right on. I'm sorry it took me so many months to find this. It told me what I've known for years. Mid-market companies do better at outsourcing than large companies -- at least proportionately. When we cut a couple of hundred grand from someone's expenses and upgrade their technology platform at the same time -- it makes a big difference.